Ciudad Valles is the second-largest city in the Mexican state of San Luis Potosí. Kick off your visit on the 22nd (Sat): scramble along the landscape with a canyoning and rapelling tour. For ratings, other places to visit, and other tourist information, go to the Ciudad Valles vacation planner. Playa del Carmen to Ciudad Valles is an approximately 12.5-hour flight. Due to the time zone difference, you'll gain 1 hour traveling from Playa del Carmen to Ciudad Valles. Wrap up your sightseeing on the 23rd (Sun) to allow time to travel to Austin. Austin is known for sightseeing, museums, nightlife, nature, and parks. 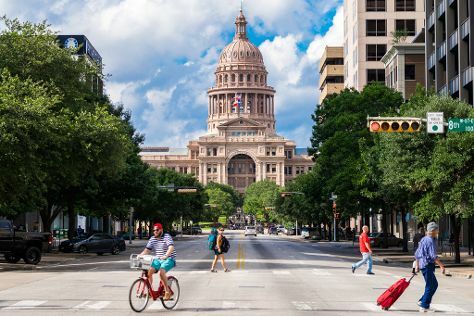 Your plan includes some of its best attractions: get a sense of history and politics at State Capitol, snap pictures at Congress Avenue Bridge / Austin Bats, take in nature's colorful creations at Zilker Metropolitan Park, and examine the collection at LBJ Presidential Library. To find reviews, where to stay, photos, and tourist information, read Austin trip itinerary planner. The Route module can help you plan travel from Ciudad Valles to Austin. April in Austin sees daily highs of 32°C and lows of 18°C at night. Finish your sightseeing early on the 27th (Thu) to allow enough time to drive to Fredericksburg. Kick off your visit on the 27th (Thu): learn about all things military at National Museum of the Pacific War and then take in the architecture and atmosphere at St Mary's Catholic Church. Keep things going the next day: make a trip to Charles Beckendorf Gallery, then stroll through Enchanted Rock State Natural Area, and then indulge your senses at some of the top wineries in the area. For photos, traveler tips, maps, and other tourist information, refer to the Fredericksburg custom trip planner. Traveling by car from Austin to Fredericksburg takes 2 hours. Alternatively, you can take a bus. Plan for slightly colder nights when traveling from Austin in April since evenings lows in Fredericksburg dip to 15°C. Finish your sightseeing early on the 28th (Fri) to allow enough time to drive to San Antonio. San Antonio is known for shopping, sightseeing, theme parks, nature, and museums. Your plan includes some of its best attractions: pause for some photo ops at The Alamo, take in the architecture and atmosphere at San Fernando De Bexar Cathedral, take in the history at Mission San Jose Church, and take in nature's colorful creations at San Antonio Botanical Garden. For maps, where to stay, reviews, and other tourist information, use the San Antonio vacation trip planner. You can drive from Fredericksburg to San Antonio in 1.5 hours. Alternatively, you can do a combination of taxi and bus. Traveling from Fredericksburg in April, expect San Antonio to be somewhat warmer, temps between 34°C and 19°C. Wrap up your sightseeing on the 2nd (Tue) to allow time to travel to Dallas. Kick off your visit on the 2nd (Tue): pause for some photo ops at John F. Kennedy Memorial Plaza, contemplate the long history of Top O'Hill Terrace, and then see the interesting displays at The Sixth Floor Museum at Dealey Plaza. Keep things going the next day: see the interesting displays at Perot Museum of Nature and Science and then take in nature's colorful creations at Dallas Arboretum & Botanical Gardens. For photos, other places to visit, where to stay, and tourist information, go to the Dallas trip generator. Fly from San Antonio to Dallas in 3 hours. Alternatively, you can drive; or take a bus. In May, plan for daily highs up to 34°C, and evening lows to 21°C. Wrap up your sightseeing on the 3rd (Wed) to allow time to travel back home.